Ninnu Kori is worth watching. Actor Nani’s last six films have been hits and he has been prolific, acting in films with few breaks in between for the last couple of years. He is the lead in Ninnu Kori, directed by Shiva Nirvana, a newcomer. The film is produced by D.V.V. Danayya and the popular writer Kona Venkat has provided the story and dialogues. Umamaheswar Rao (Nani) is doing research at Andhra University and helps out fellow student Pallavi (Nivetha Thomas) who wants to dance at her college anniversary day. The two fall in love and decide to marry. But, predictably, Pallavi’s father (Murali Sharma) wants a boy who is well settled in a good job. He gets her married to Arun (Aadhi Pinisetty), who is settled in the US. A year and a half later, Pallavi comes to know that Umamaheswar is in the US, but he is not doing well and has become an alcoholic. She persuades him to live with her and her husband for a few days so he can see how happy she is. Her husband Arun agrees to have him stay in their house. But Umamaheswar has only one thing on his mind: how to get back Pallavi. The film unfolds the events of Umamaheswar’s stay with the couple, how they interact, and who Pallavi chooses. Director Shiva Nirvana has come up with a simple script and story, but it is narrated in a beautiful manner. There is entertainment, romance, love and also some heart-touching scenes. It might bear a resemblance to the Hindi film Hum Dil De Chuke Sanam, but it’s different. The screenplay by Kona Venkat and the director together, gives the film an unexpected twist. The humour is interspersed between scenes and the climax is heart-touching — rather in the mould of Karan Johar or Yash Chopra. Nani, Nivetha and Aadhi all give good performances. Nani has already proved that he can do any kind of role with ease and in this film, too, he comes out with flying colours. Nivetha Thomas actually steals the show with her stunning performance. This is just her second film, but she gets the emotions just right. Aadhi Pinisetty is a big surprise in theis film. His character is important towards the end and the scene between him and Nani about staying in his house is bound to get applause. Murali Sharma as Nivetha’s father is adequate and provides a few laughs with Prudhvi. Thanikella Bharani plays the usual role of a professor. There are plenty of humorous scenes to entertain you. Gopi Sunder’s background score is a big asset to the film. The cinematography by Karthik Ghattamaneni is also superb. Kona Venkat has struggled with the dialogues in earlier films, but here he is in good form and has written some realistic dialogues. On the down side, the film is a bit slow and picks up momentum only after the interval. 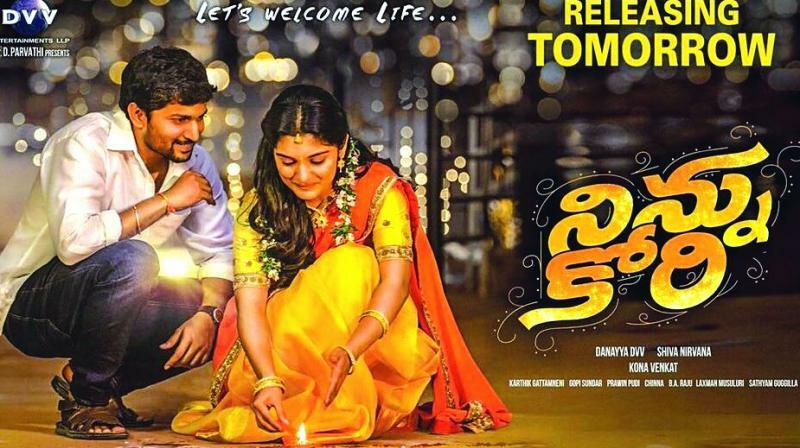 But on the whole, Ninnu Kori is worth watching.